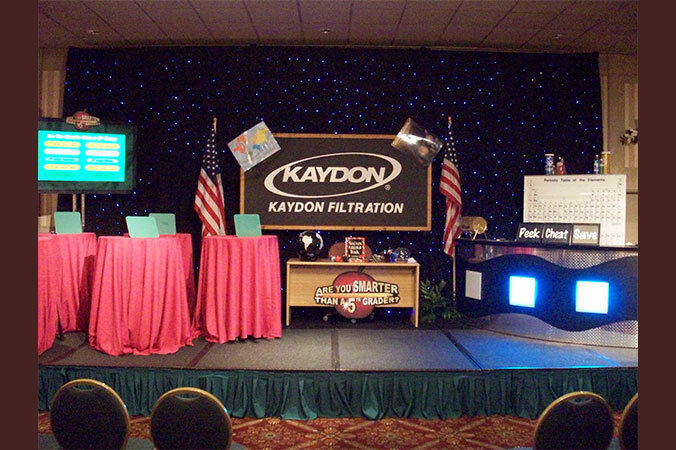 bring game shows to your next event! 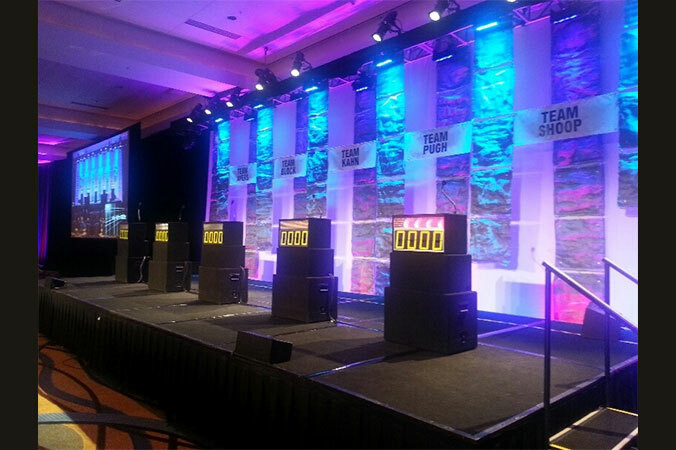 Take corporate team building to the next level with TV Game Shows. They’re Educational. 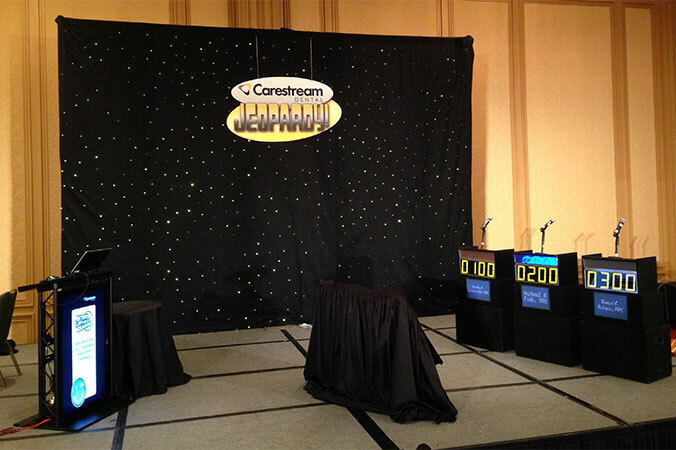 Game shows provide limitless opportunities to educate guests on products. They Build Relationships. Participants instantly benefit from working as a team during game play. They’re FUN!. Yep, learning is great, but sometimes, you’re just looking to have a little fun! For this, you need two teams of five players per team. 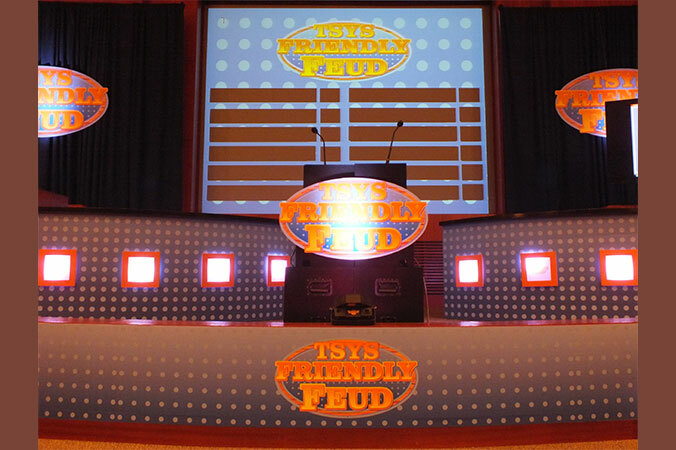 One member of each team faces the other in a face-off as the host reads the question off the game board. The team that buzzed in with the correct answer receives control of the board and has the option of playing or passing control to the other team. The team that has the control tries to reveal all of the correct answers to the question before receiving three strikes. Just like the TV game but without Big Steve. Based on the popular television game show of the same name, this game challenges everyone's knowledge of subjects taught in the fifth grade. It's a fun trivia game for groups of four players. Take a turn, draw a card and read the question aloud. Then pray that your opponents get it wrong! Copy, Peek or Save then rack up the play money. Put your brain power to the test with Jeopardy the TV Trivia Game Show. Play Jeopardy with your colleagues and choose from categories such as Sports, Pop, Stars, Holidays, Sitcoms, Music, etc. Don't forget about double and final Jeopardy as they are included in the game. Jeopardy puts a twist on most average trivia games since instead of searching for the answer, you answer with the question! Another favorite TV Game Show, the Deal or No Deal game will put you in the hot seat. Players of Deal or No Deal choose a briefcase with a hidden amount of play cash in it. The game gets tricky as 26 briefcases slowly get opened and your chances of having the "million dollars" either increases or decreases. Will you take the bankers offer or test your luck with your chosen case? 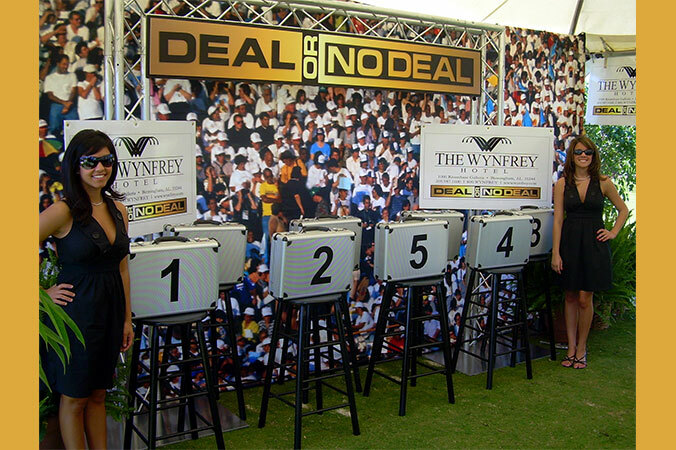 The Deal or No Deal game is great fun and a test of nerves as you push your luck with each case number you choose. Complete with trivia pods! You can choose your own quiz questions or let us write them for you. Fun prizes for those teams who get the highest score with most correct answers. The best part is, of course, hitting the buzzer. Enjoy the sights and sounds of a warm spring day at the thoroughbred track at your very own derby day. Colorful horse and jockey silhouettes are set along white track fencing sections to greet all your honored guests. Upright stable flags further enhance the entrance. Race programs are handed out to each and every guest highlighting the 10 races for the evening. 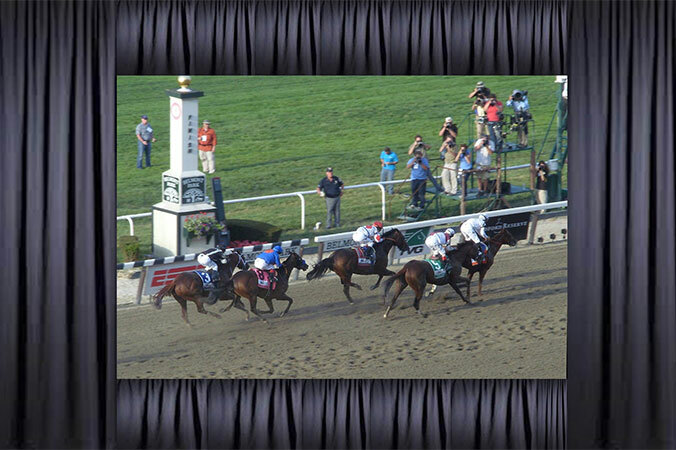 The program comes complete with all the information needed, as well as your play money to wager on the thoroughbreds. The ballroom will be uniquely decorated to support the derby theme, including a winner circle photo op complete with a 3-d life-size horse statue, winning jockey, Toledo scale and circle of roses. Your evening's emcee will explain the program to the guests and parade the horses for the first race. The horses are led into the gate and all guests are invited to place their bets at the antique betting windows. Cashiers take bets on the first race as we announce, “5 minutes till post time". The trumpet sounds and the excitement begins. Watch your guests as they cheer their favorite horses around the final turn to the finish line and collect their winnings.